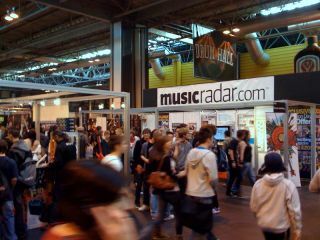 7 reasons why Music Live rocks! This weekend, Birmingham NEC plays host to Music Live. The huge music-making show is open to the public and features numerous star performances and a drool-worthy array of the sexiest guitar, drum and hi-tech gear. It must be odd for the bands concerned to rock out at a time when they'd usually still be comatose on the tour bus, but rock out they most certainly did with Friday's highlights including Riot:Noise and Mexicolas. It's usual to see many punters leaving the show with a suspiciously guitar-shaped cardboard box tucked under one arm. With some of the great deals on offer from retailers at the show it's easy to see why. Show music is a genre in itself, and slap bass and copious amounts of widdling are de rigeur. We've no idea who the man in the silly mask was wailing away on the Music Man stand, but the crowd of people watching him seemed to be enjoying it. The biggest star in the building on Friday was probably Megadeth's Dave Mustaine. Never let it be said that Megadeth have an ageing fanbase, but we did see him sign somebody's walking stick. Someone once said that rock 'n' roll ain't noise pollution. That said, thank goodness for electronic drum kits, which allow drum tutorials to take place in relative silence. Interested parties can pop a pair of headphones on, everyone else comes away with their hearing intact. Music Live is a bit like being in a giant music shop. Helpfully, the Gibson stand had an array of PODs for people to use to play a wallet-bothering line-up of Les Pauls, ES-335s and SGs. It's not just about the star turns. Thanks to several open mic stages, if you are feeling confident then there's nothing to stop you getting up and performing. You might even win a prize.